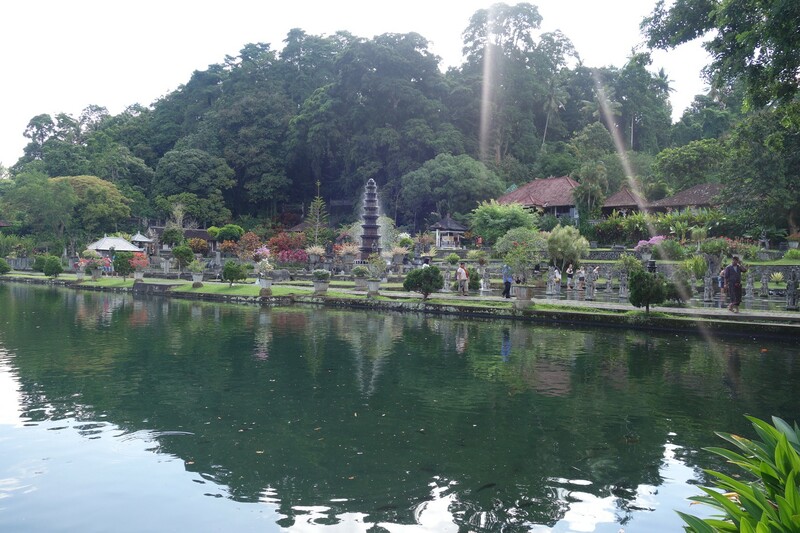 Tirta Gangga is one of those places in Bali that made me swoon just by looking at photos of it online. 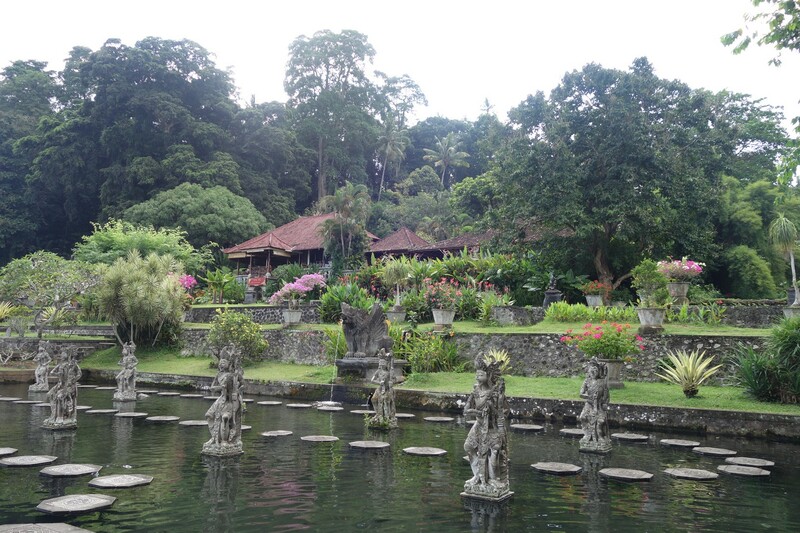 Romantic, regal, and restful, I knew that it would be a good stopover for our honeymoon. There was just one tiny problem: it was FAR! 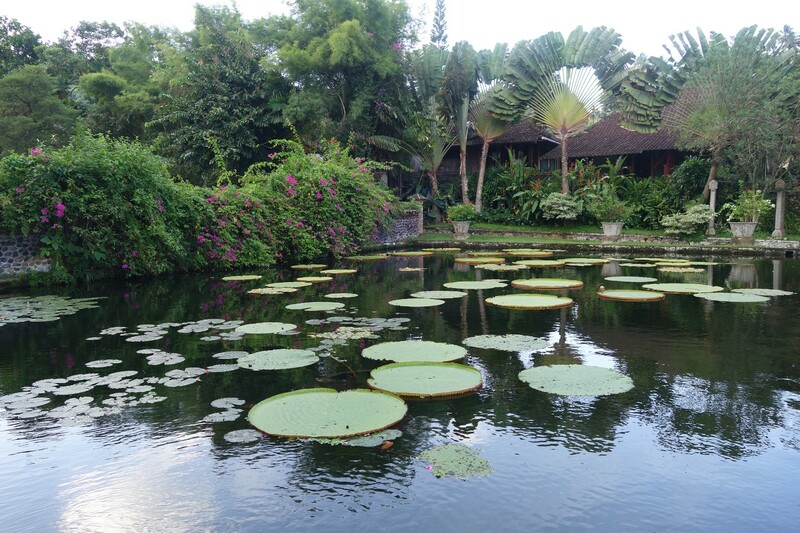 Located in East Bali, it is about a 2-hour drive from Seminyak, where we were staying. 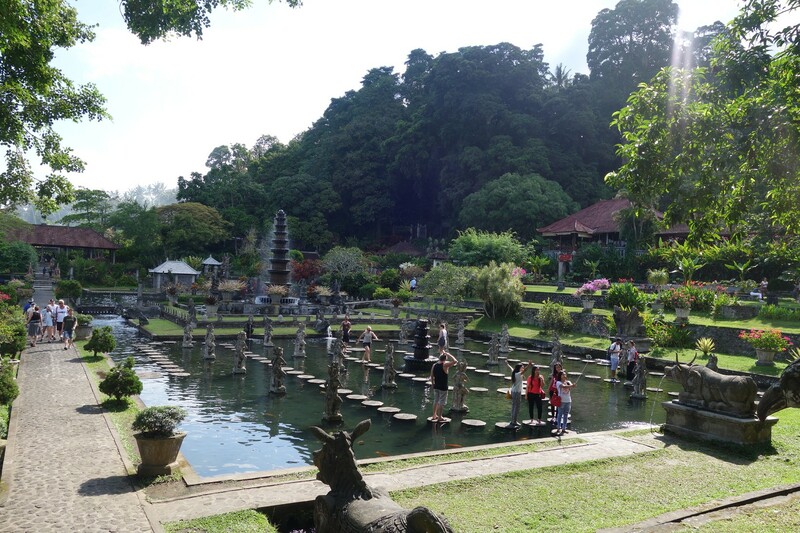 Was it really worth going to East Bali just for a water garden? 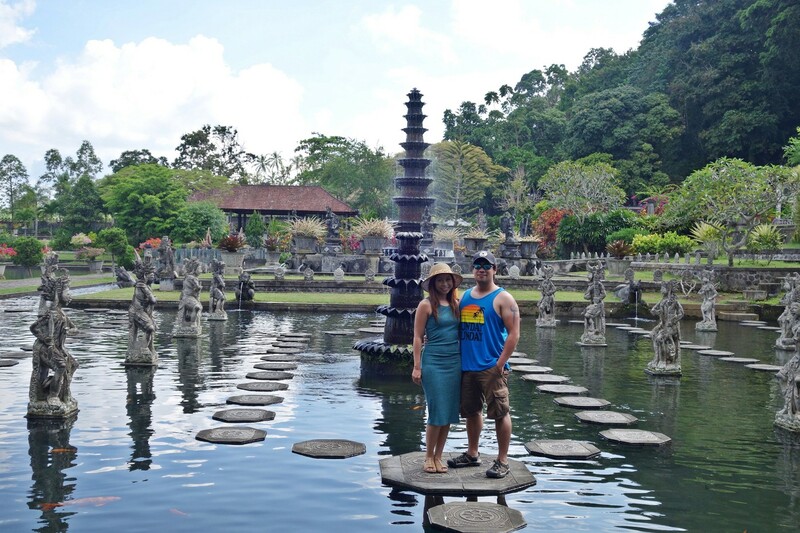 Luckily, the day before we went to Tirta Gangga, Mike and I have sort-of spontaneously decided to go white water rafting at the Telaga Waja River in Karangasem, which was not too far away from Tirta Gangga, so after our adventure, we went straight to this beautiful water palace! 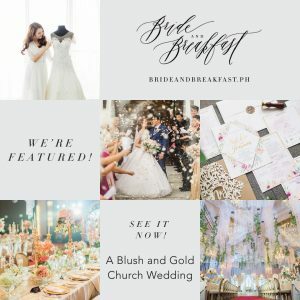 The photos I saw of this place were completely swoon-worthy, but in person, it was a whole different level of stunning! Gorgeous in photos, lovelier in person! 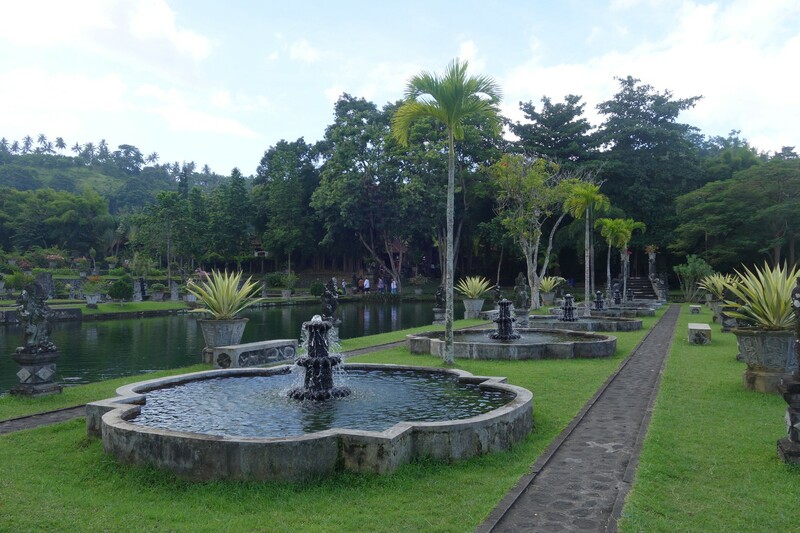 Tirta Gangga is actually a former royal palace, built by the late King of Karangasem in 1946. 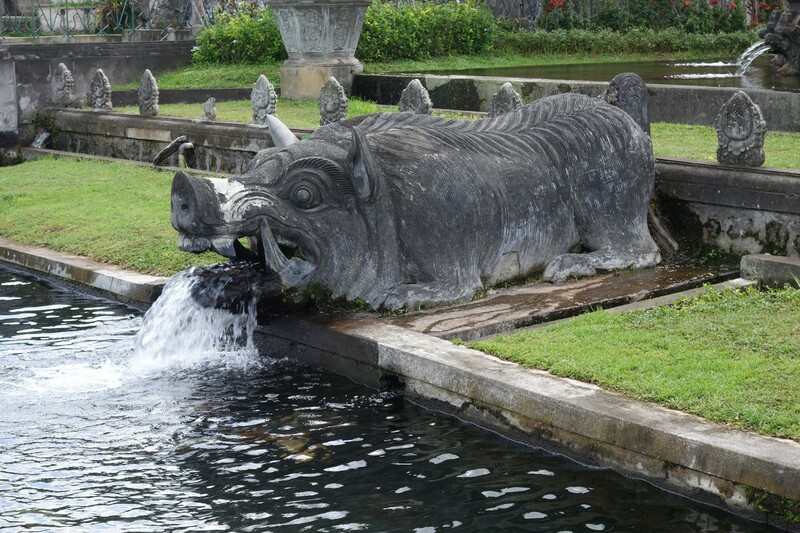 The complex was destroyed by the eruption of the nearby Mount Agung, which, by the way, is still an active volcano! 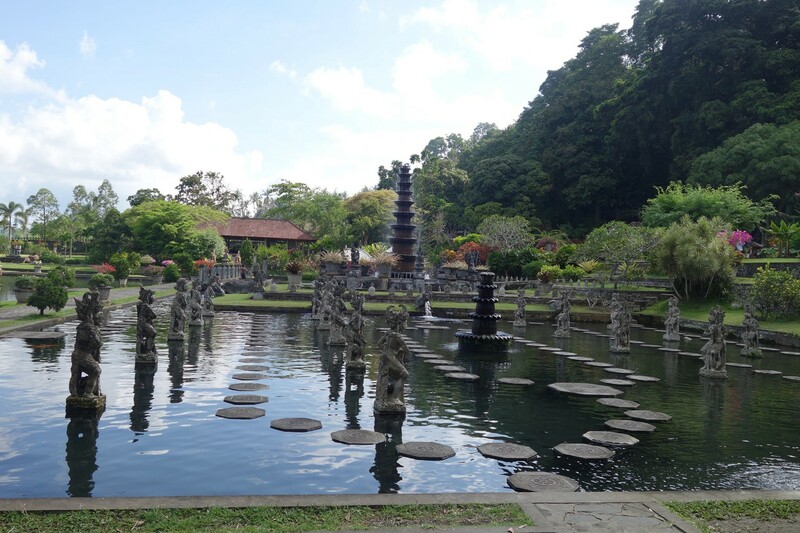 After the destruction, Tirta Gangga was rebuilt. Now, if you look at the majestic site, you would not believe that it went through so much damage! 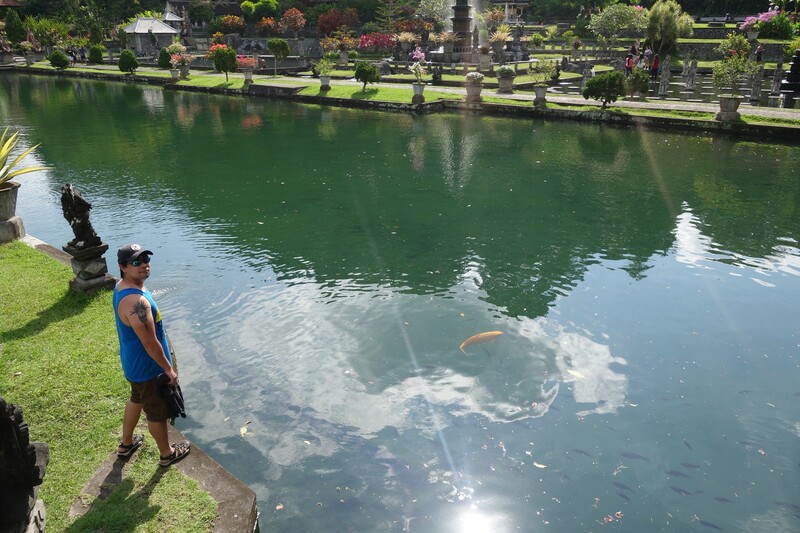 The name Tirta Gangga translates to “water from the Ganges.” The Ganges River in India is the most sacred river to the Hindus, and Tirta Gangga in Bali is considered sacred by the Hindu Balinese. 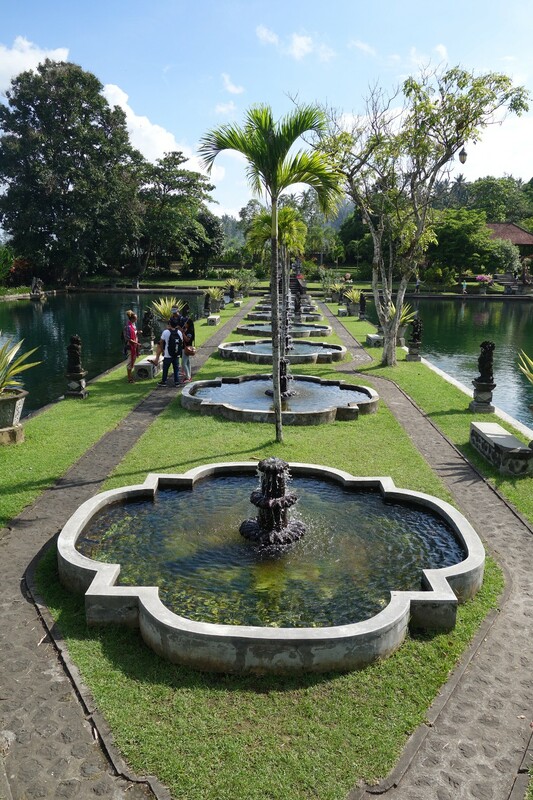 The water in the gardens is also believed to be holy by the locals, and they not only use this water for bathing, but also for drinking. 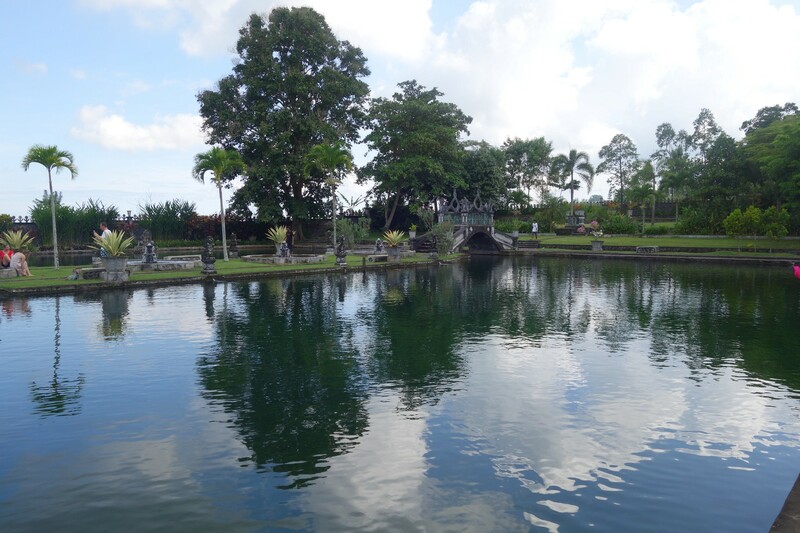 Water is everywhere in Tirta Gangga! 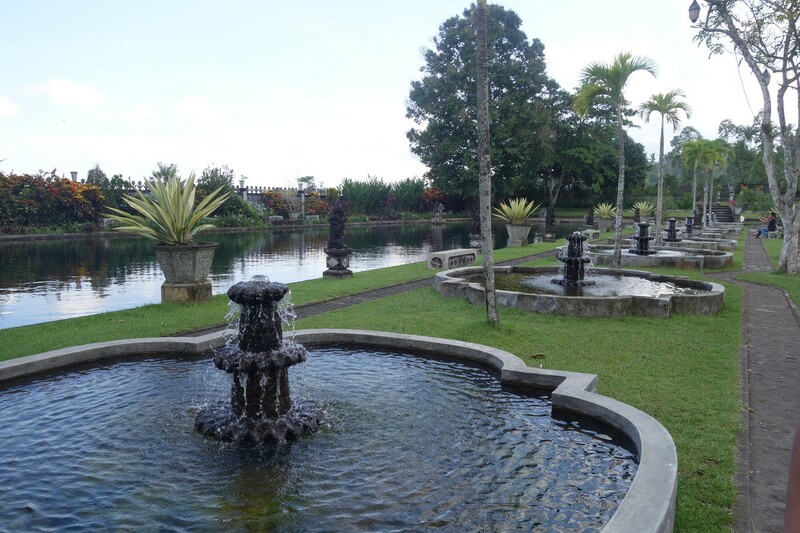 Ponds, swimming pools, and fountains abound in this picturesque water palace complex. 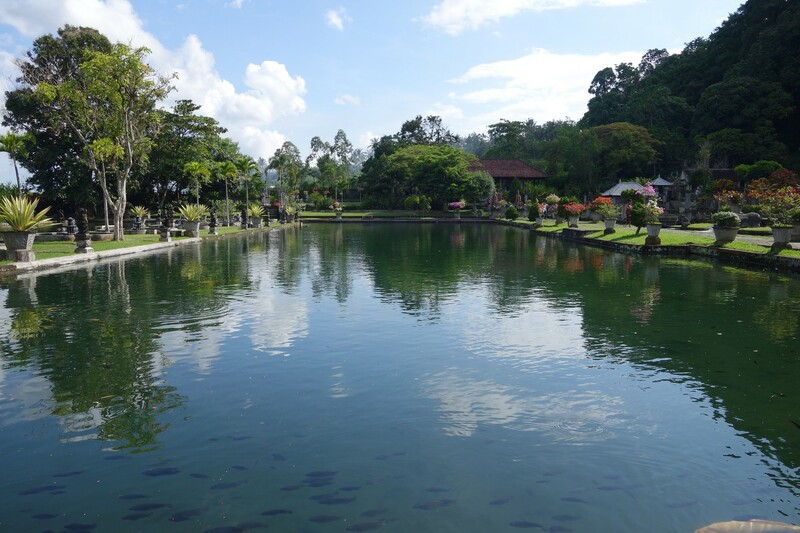 If you love the water and nature, this is going to be heaven for you! 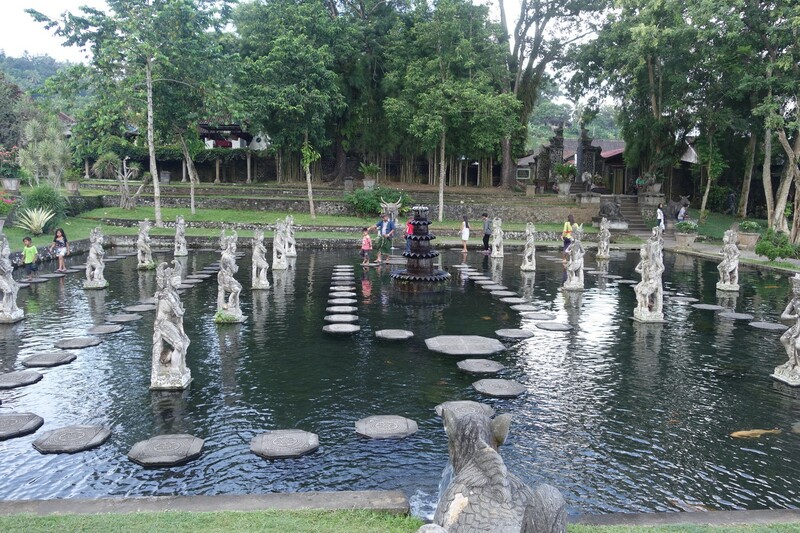 Upon entering the water palace, the first thing that will grab your attention is this pond where weapon-bearing stone figures stand. 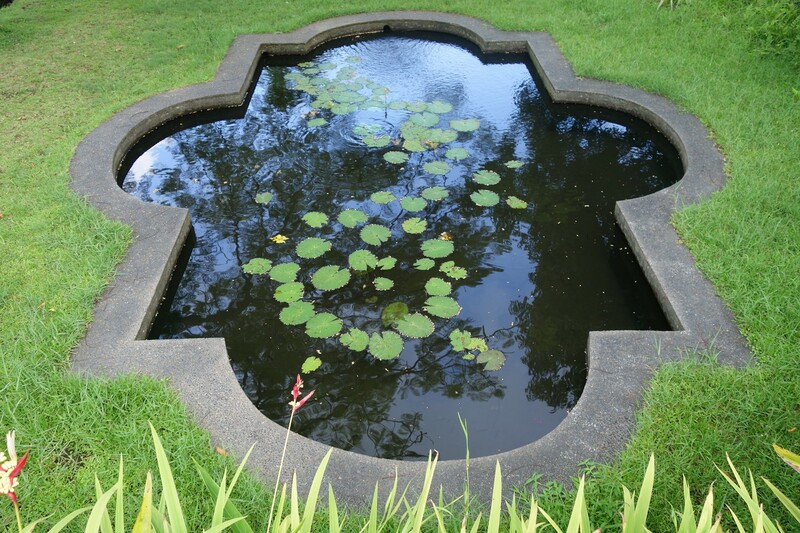 Here, octagonal stones are placed for visitors to step on as they explore the pond. This is my favorite area in this place! 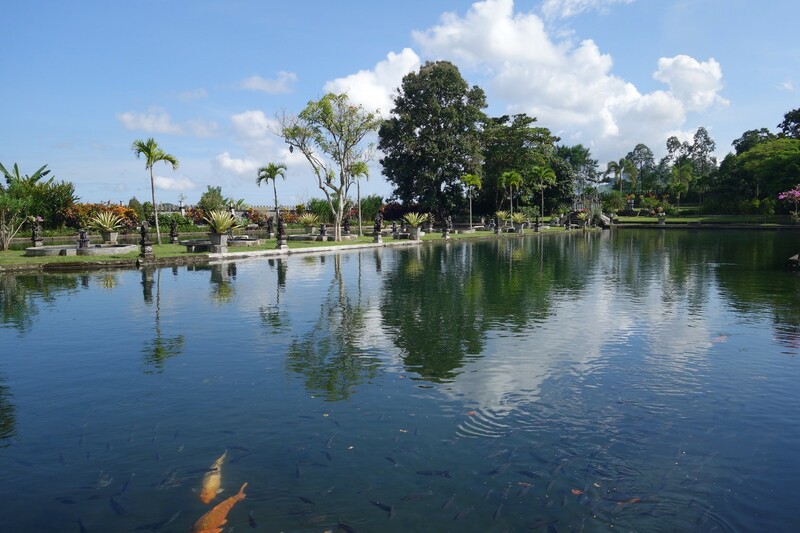 It’s like a kingly playground where you can hop from one stone to the next, while watching the fishies in the pond. The kids frolicking around here seemed to really enjoy it! 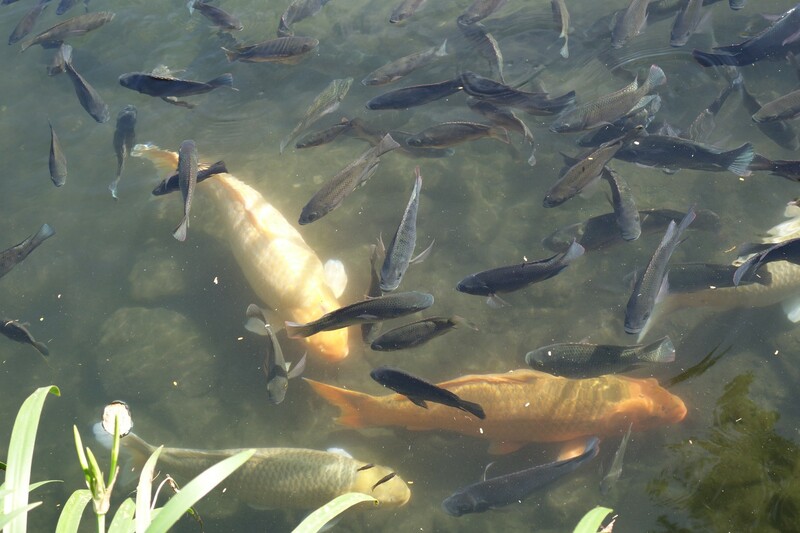 The water is pretty shallow, but watch your step anyway! 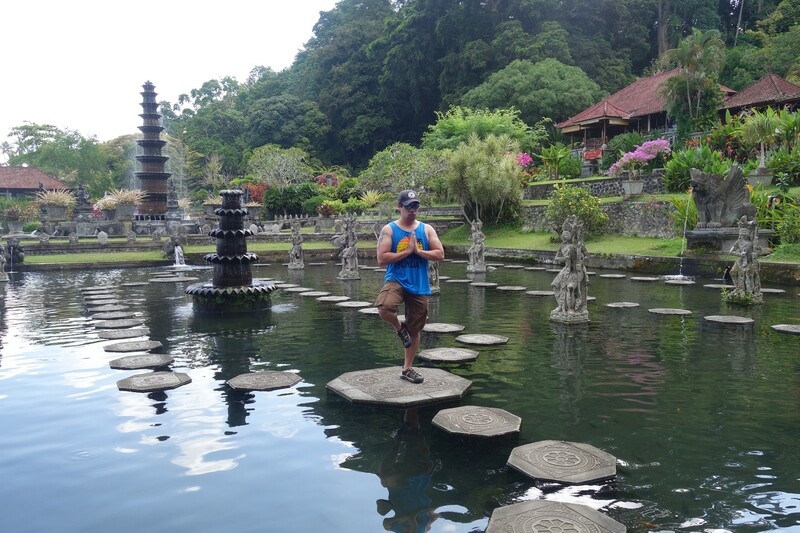 Best place to do yoga! I really wanted to do some kind of yoga pose but I’m too clumsy so I didn’t risk it. 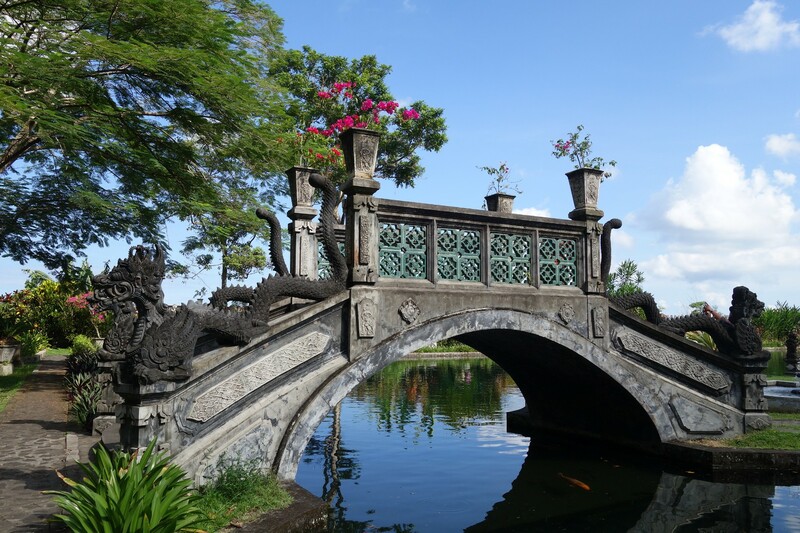 Another amazing spot in the water palace is this bridge overlooking two large and clear ponds. 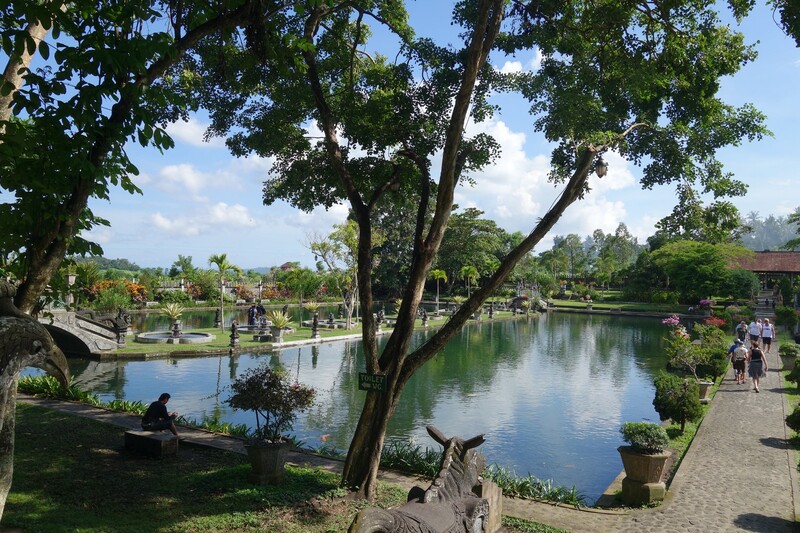 From the bridge, you get a great view of the entire complex, including the ponds, the fountains, and the rice terraces. 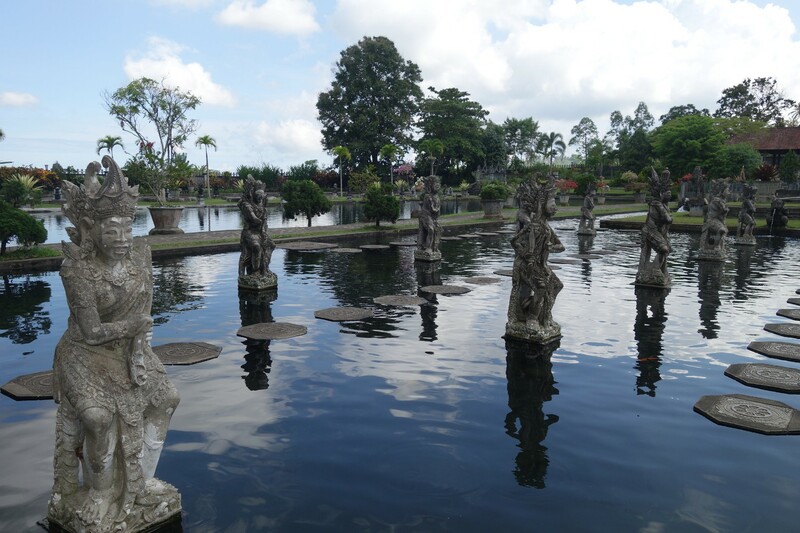 A row of fountains, as taken from the bridge. 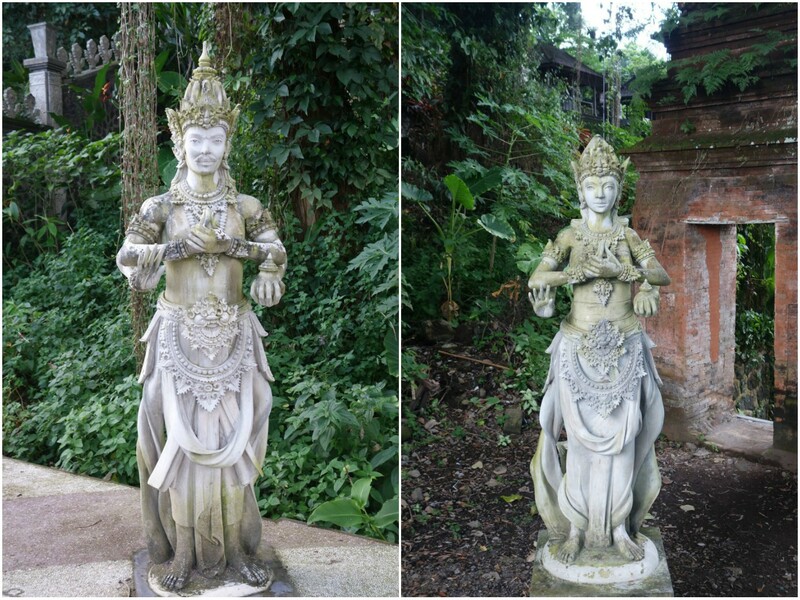 You can see the Hindu influences here. 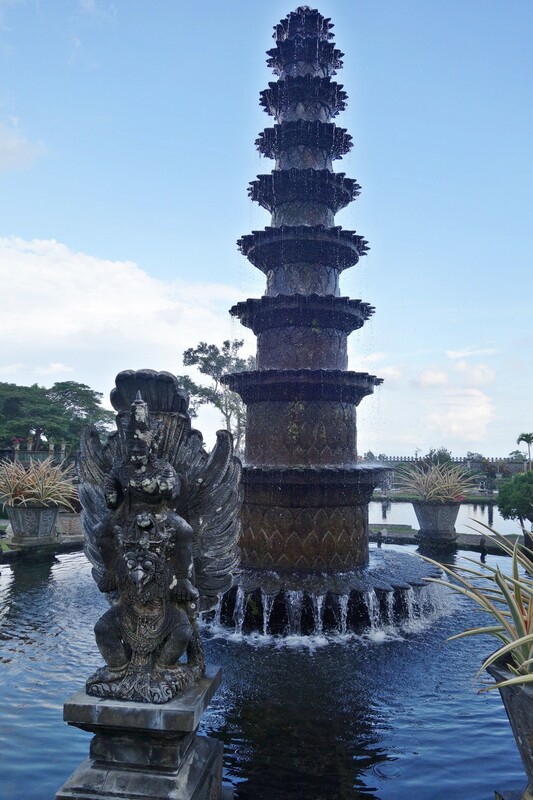 The focal point of Tirta Gangga is a 10-meter high fountain with eleven tiers and a lotus flower on top, surrounded by statues. 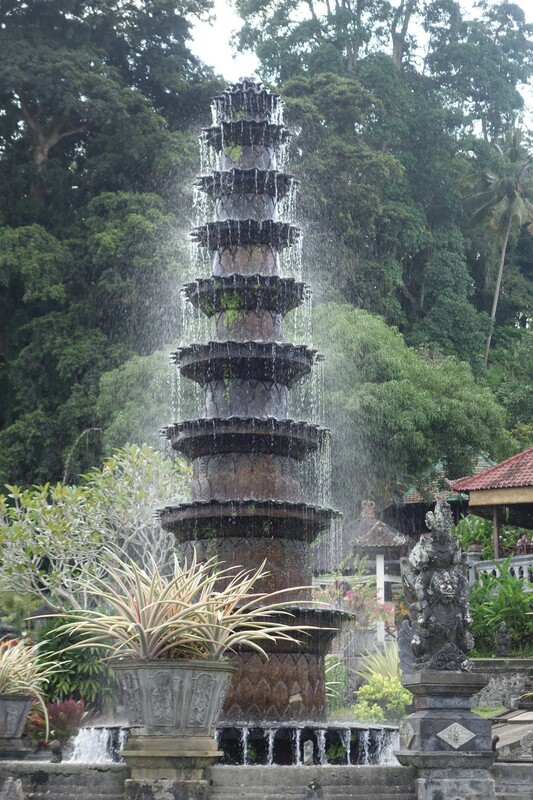 Even from afar, this fountain has a way of catching your attention, especially in photos. 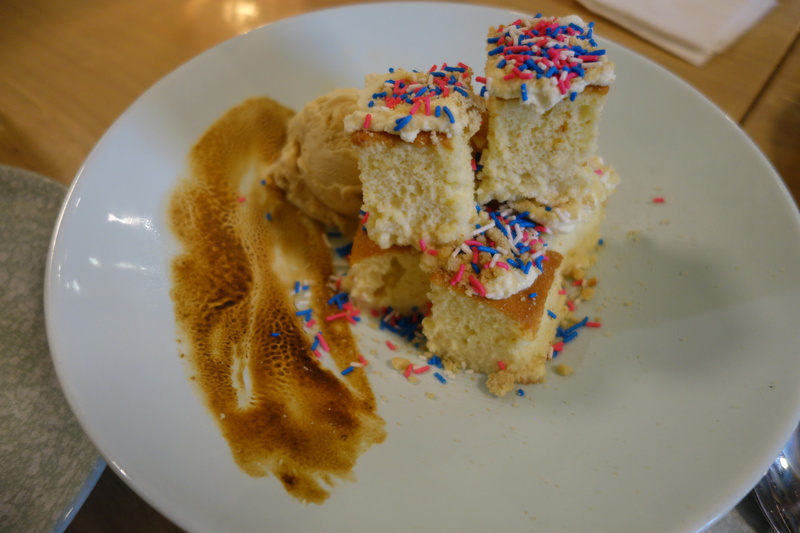 …and this… what is this anyway? 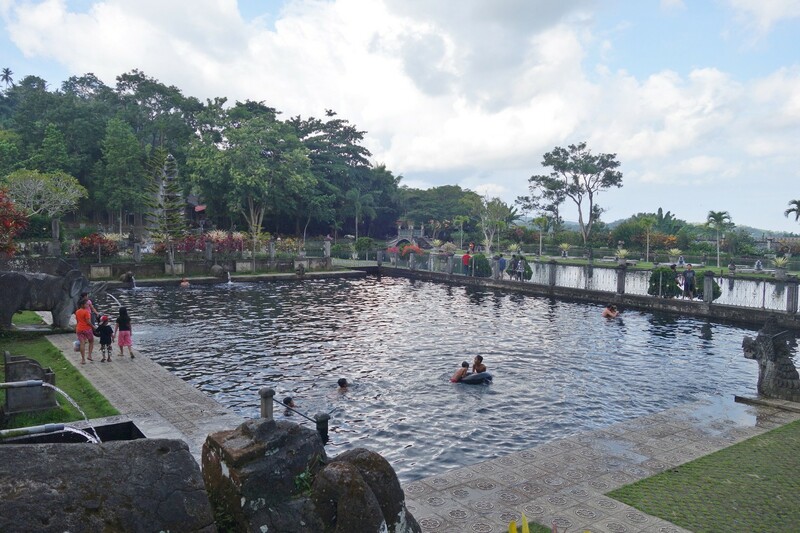 There is a pool where visitors can swim for a small fee. If you’re planning to visit, it might be a good idea to bring some changing clothes. I don’t know how deep the water is, but there were a couple of kids jumping in the pool, so I’m guessing it’s not too deep (or they’re just really good swimmers). Swimming pool. Yes, you CAN swim! 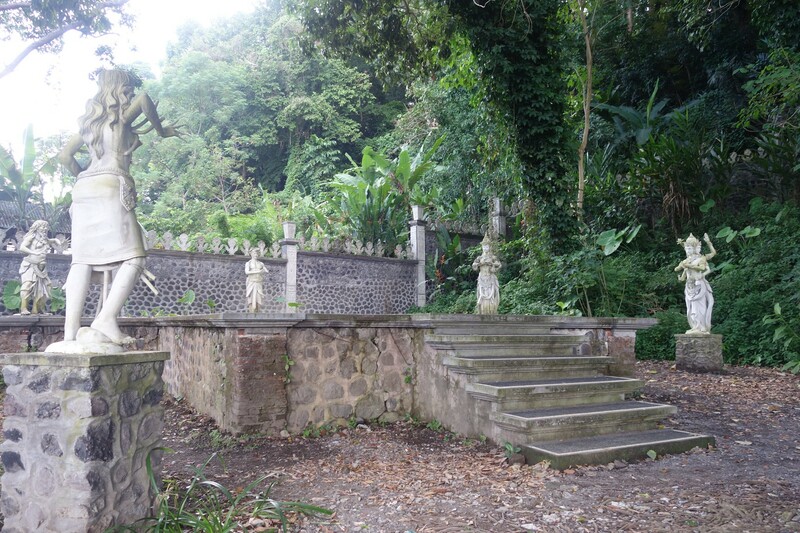 Mike and I found a quiet area behind the swimming pool that resembled a stage, surrounded by statues. I wonder if performances are held here? They say two heads are better than one. Well, FOUR hands are better than two! 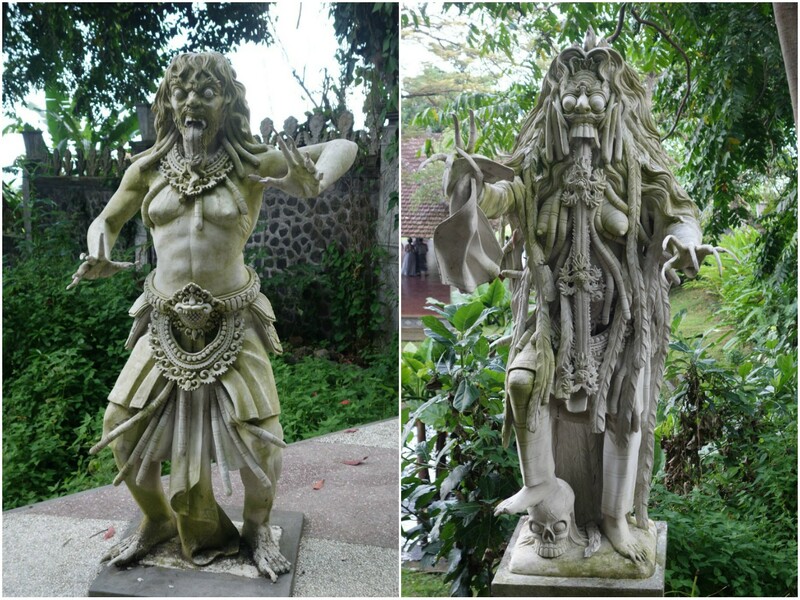 These ones look like the White Walkers from Game Of Thrones! 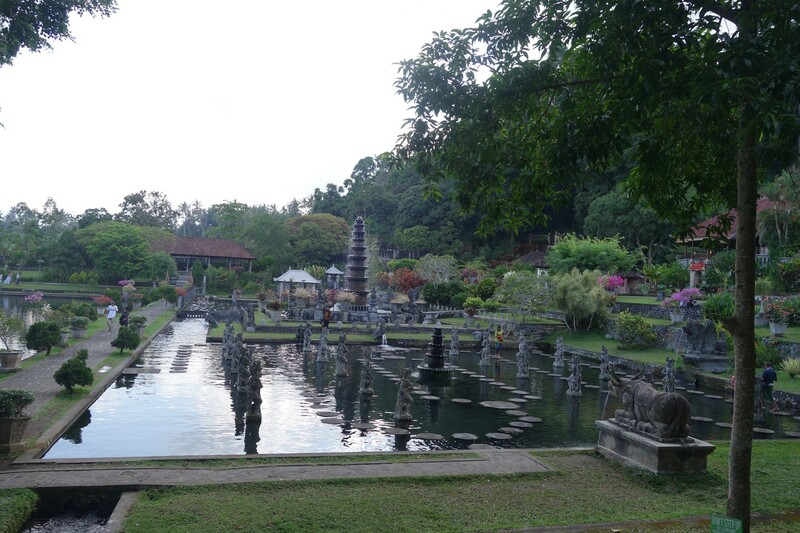 No question, Tirta Gangga is one of the most breathtaking gardens I have seen. 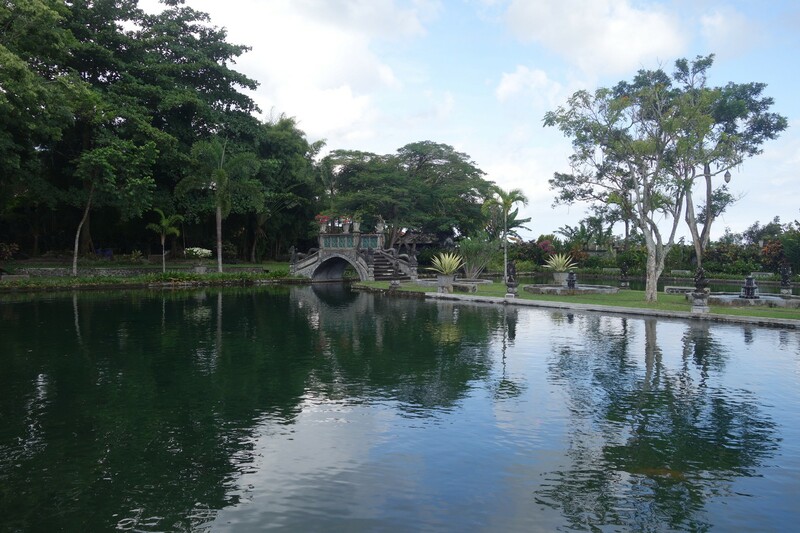 Even on a slightly gloomy day, the tropical gardens and sparkling waters are such an incredible sight! Seriously, how could you not want to see this place for yourself? ✓ …you have time to spare. 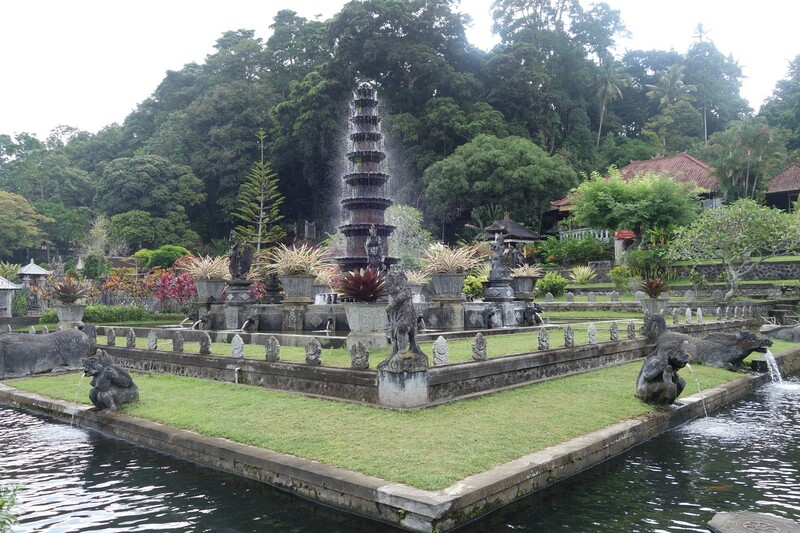 Since we were in Bali for 12 days, we could afford to “waste time” on the road for two hours and back just to see this lovely garden. 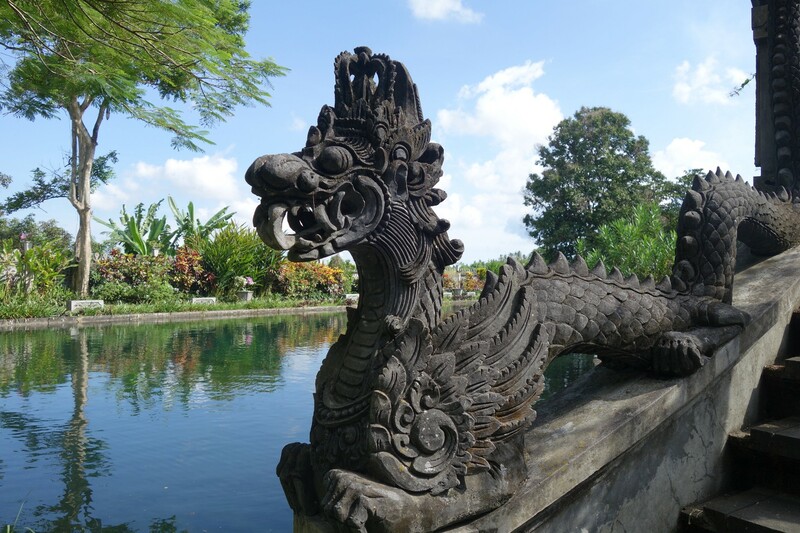 BUT if we only had a few days, we might not have prioritized this and stayed in Ubud and Seminyak instead, where most of the action is. 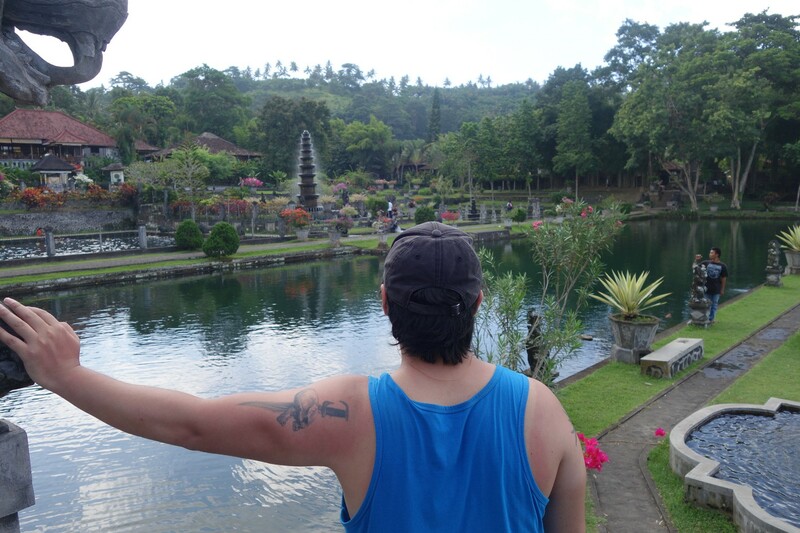 ✓ …you really, really, really LOVE nature. This should be obvious enough. If you’re big into nature, I highly doubt that you’ll get bored here! When you enter, a tour guide will approach you and ask if you want him to take you around and tell you “stories” for a fee. You can accept his offer, but we didn’t, and we never felt like we missed out on anything. 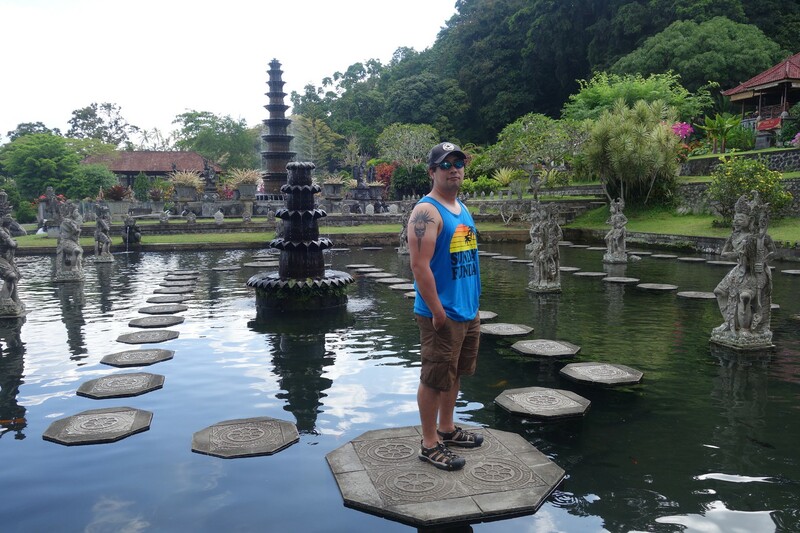 We did have our own tour guide (our driver) but we just let him rest. It’s one of those places where you can survive on your own, without a guide. 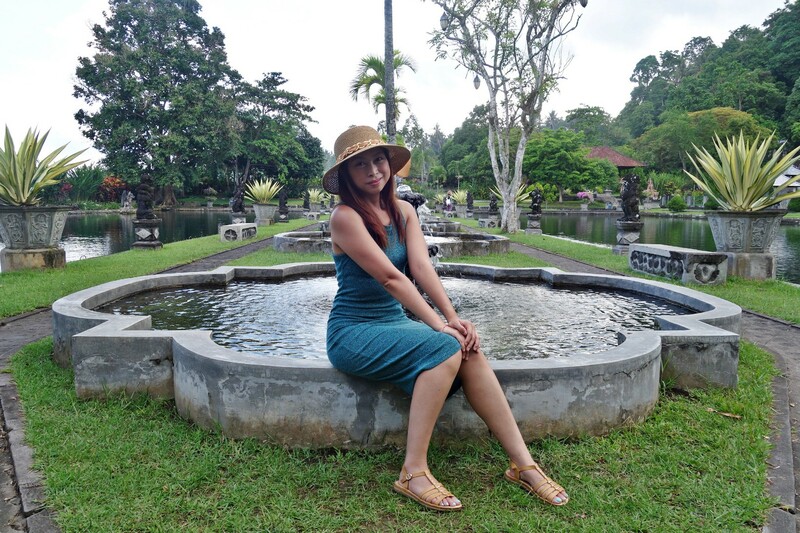 In fact, it was quite nice to have some private moments with my husband in such a magical place. Our tour guide did check up on us every now and then, though, and the few couple shots that you see in this post were taken by him. 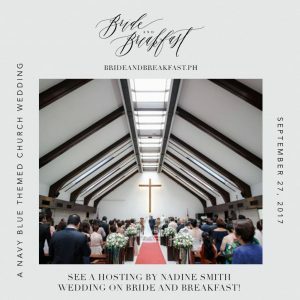 What to bring: definitely your camera!!! 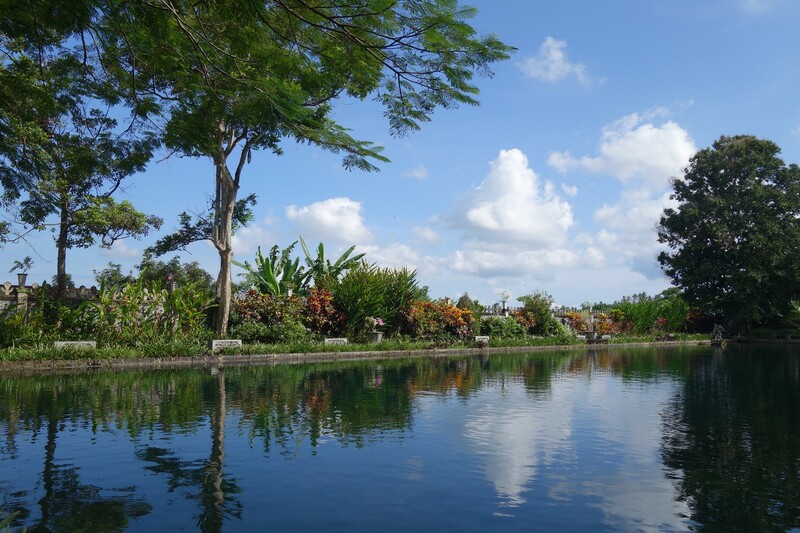 And swimming and changing clothes, if you plan on taking a dip in the swimming pool. 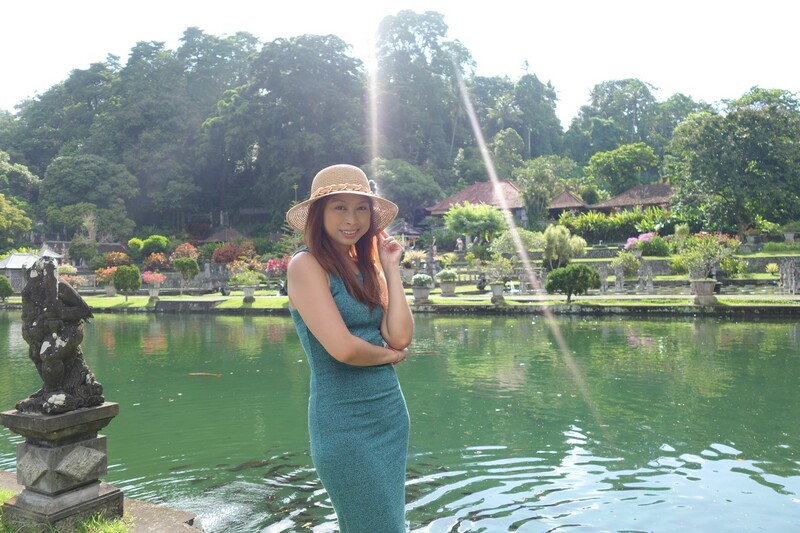 Do bring sunscreen on hot days! There is a restaurant within the water temple complex, in case you get hungry. I don’t know if it’s good because we didn’t eat there. 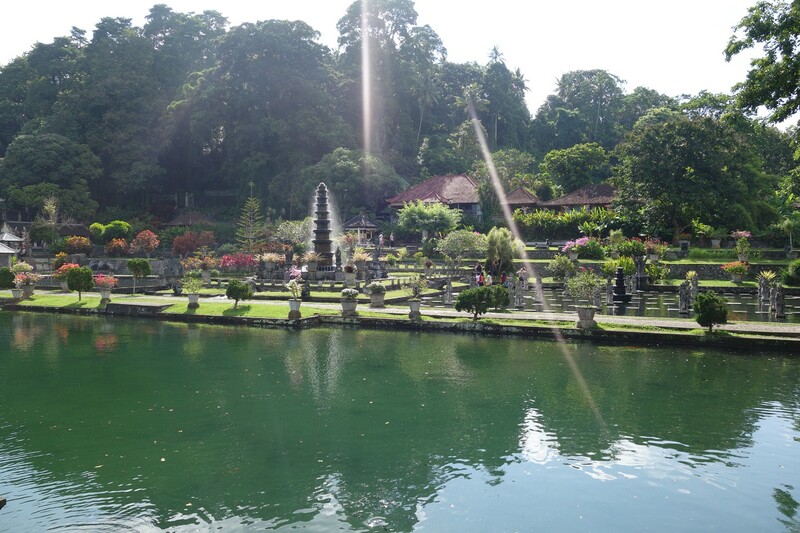 Try to visit on a weekday. It gets crazy on weekends! How to get there: Rent a private car with driver / tour guide. 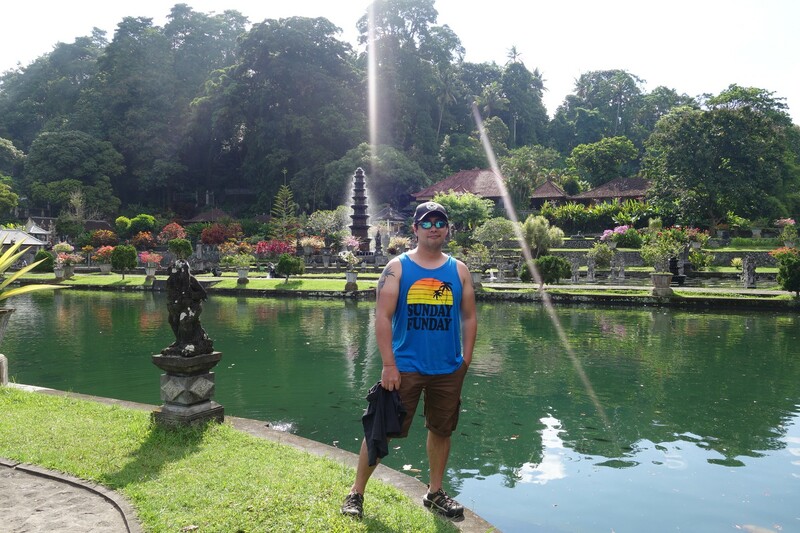 I recommend Galih Bali Tour. Wow! What an absolutely stunning place! 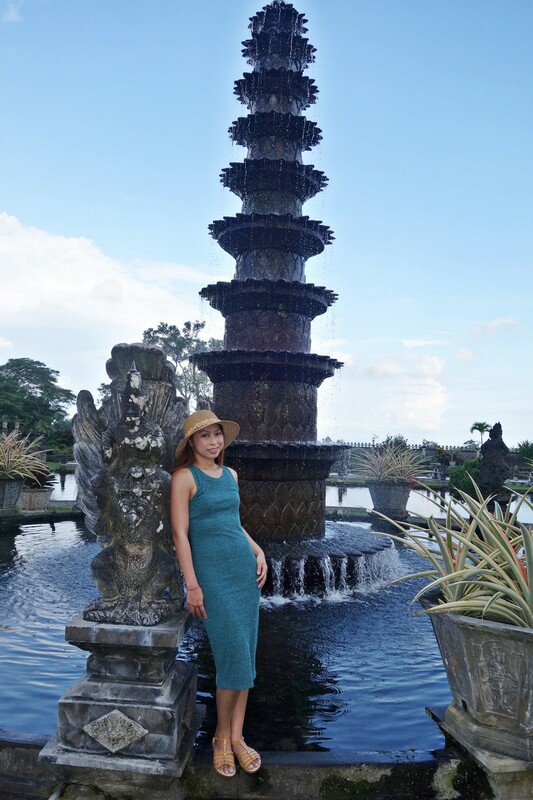 This water garden is fit for a Queen! 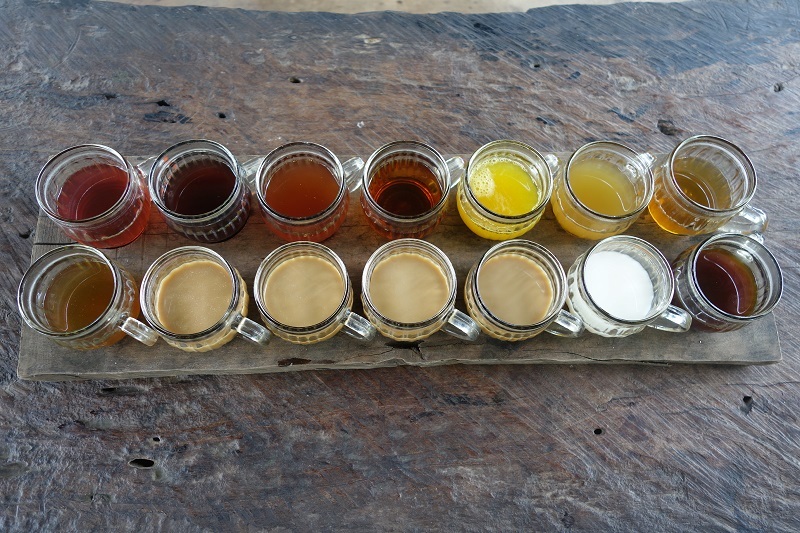 I could spend hours wandering around and checking this place out – and I would definitely drive 2 hours to see this place! It’s a photography lovers dream! What a great spot to have your honeymoon in! 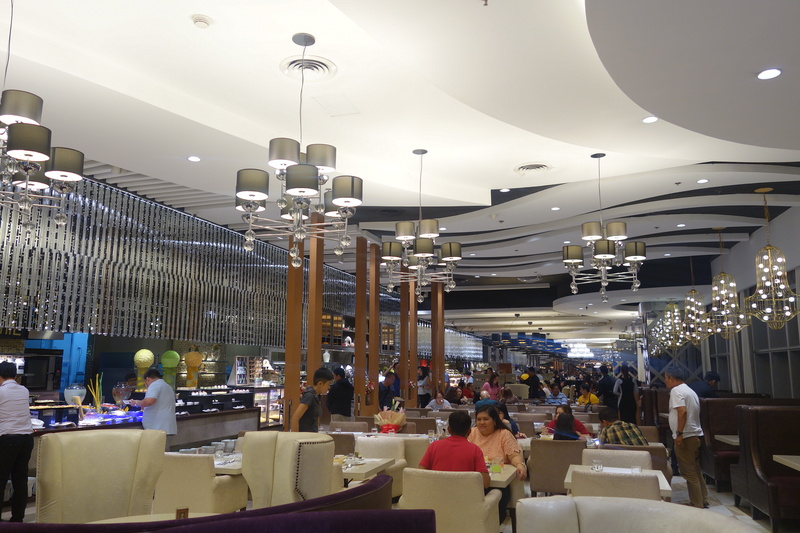 Plus, the place looks ultra luxurious – I bet it was a perfect vacation for you! 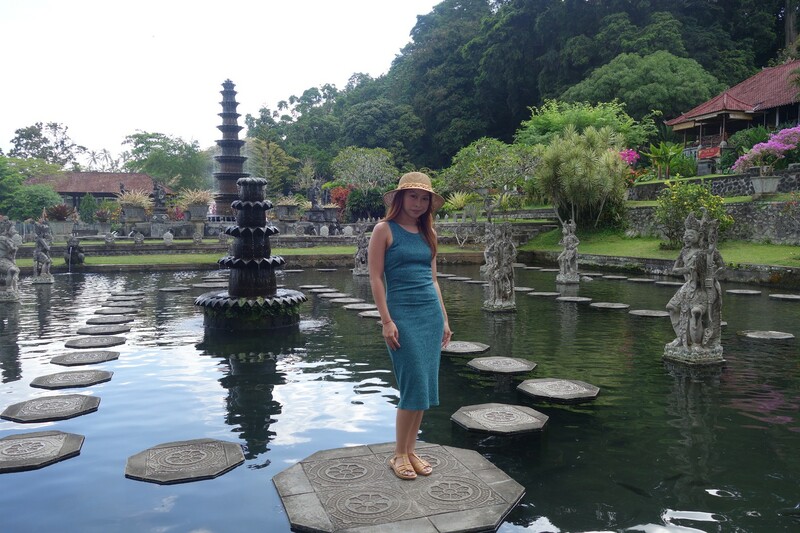 Tirta Gangga Water Palace is so gorgeous and serene. 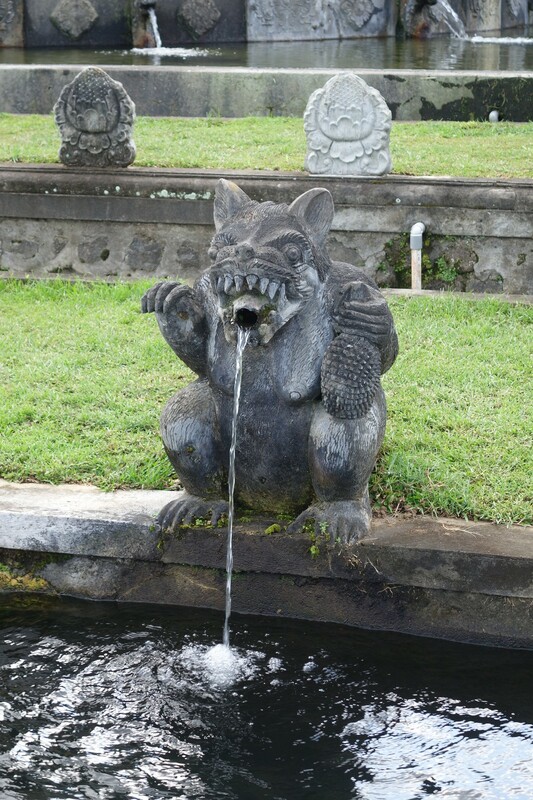 Bali temples are amazing and this has to be one of the best. 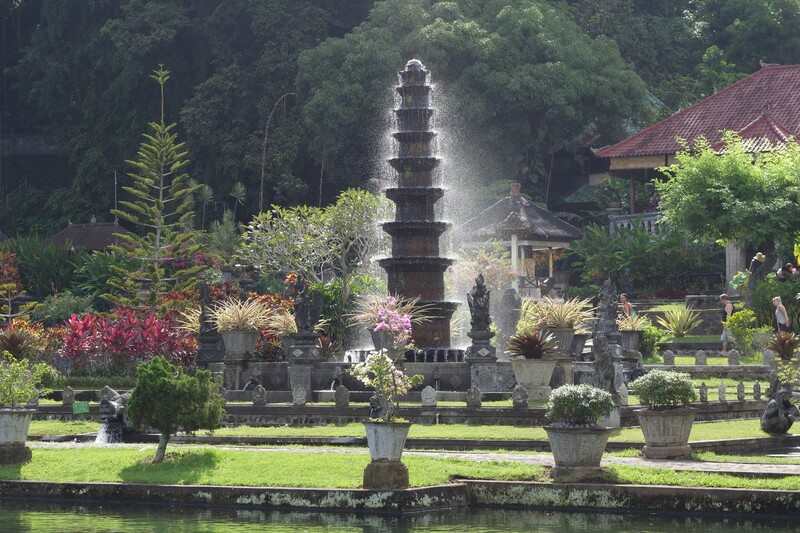 Thanks for the beautiful photos that really give a good sense of the temple and grounds. The garden look stunning! I knew they must be connected with the royalty even before you mentioned it. We both love spending time in nature and would probably consider 2 hours trip totally worth it. That is absolutely stunning! Even before I got to the part where you mentioned that it’s a palace, I kind of already guessed that it was. Only a palace would be this pretty. 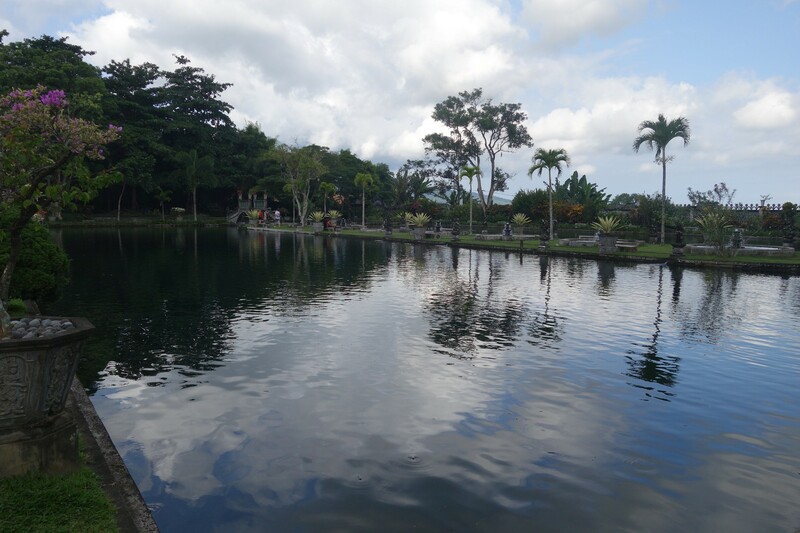 PS Being the clumsy person that I am, I’d definitely fall in that pond. Lol. You’re right. I love water and nature and I think it would be heaven for me! 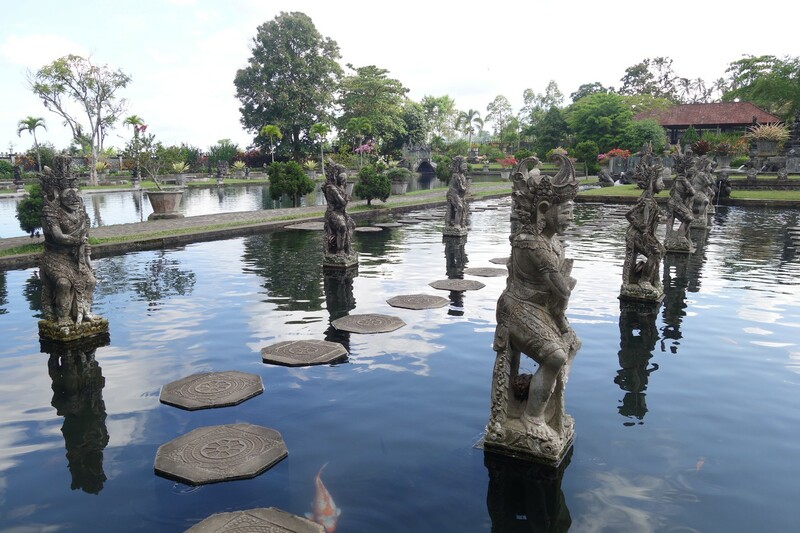 Those stepping stones are such a clever idea for exploring. 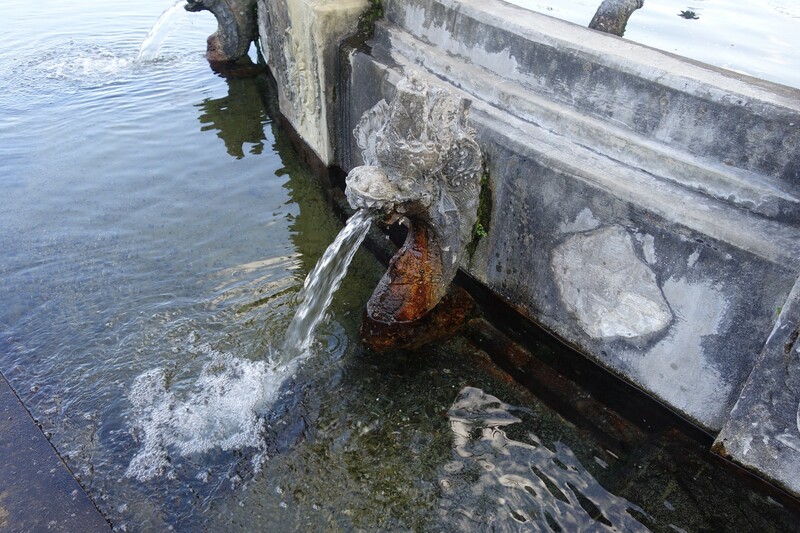 The fountains are also amazing. This place looks like a photographers dream! I had not heard about this place. But it seems very beautiful and peaceful. The pics are really amazing. Thanks for sharing this. I have not heard of this place. It looks just incredible!! 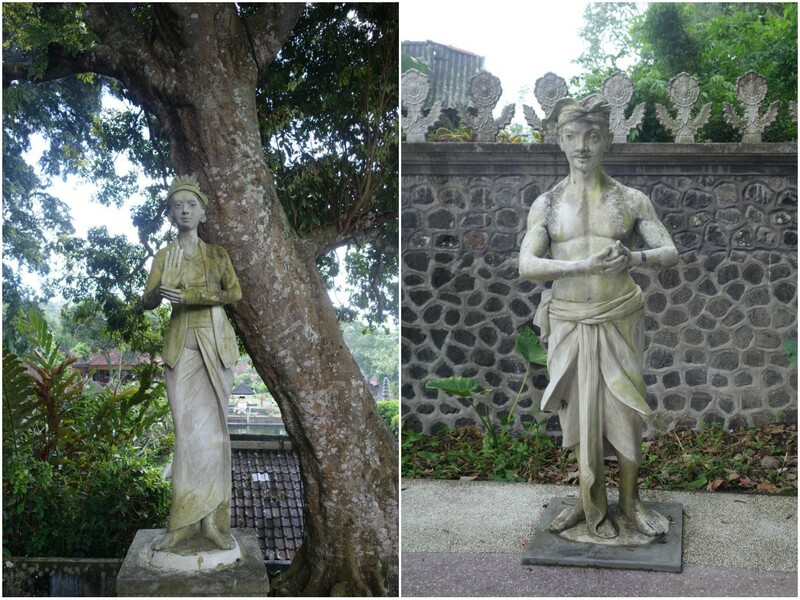 There is soo much the kids would love – especially those statues. The one guy with the curly fingers would certainly get any tweens attention! !